I believe this is now complete. Corrected two Part Values on Overlay Picture and Added another Picture: "Nov 16, 2017"
down to a Trickle Charge. This Charger Can't be used as a Power Supply, Without having a battery in place. The Battery MUST be Connected to get power out. Note: This Charger Features a Reverse polarity Indicator. FIRST Connect this Charger to the Battery. but the Reverse Polarity LED will light up. If that LED Does light, Reconnect the battery Correctly, than apply the 110 line voltage. Connecting the Line voltage, With a reversed battery connection, WILL Result in Damage. Especially if you don't use the fuse on the output, as shown in the schematic. Although Not Shown in the schematic, A suitable Line fuse would also be advisable. the positive or negative line, going to the battery. The Transformer, Diodes and SCR, Must be caplable of handling the output current. Allow youself a Safety margin! Use a 15 Amp transformer. Also the Diodes and SCR will Definately require a Suitable, LARGE Heat Sink! 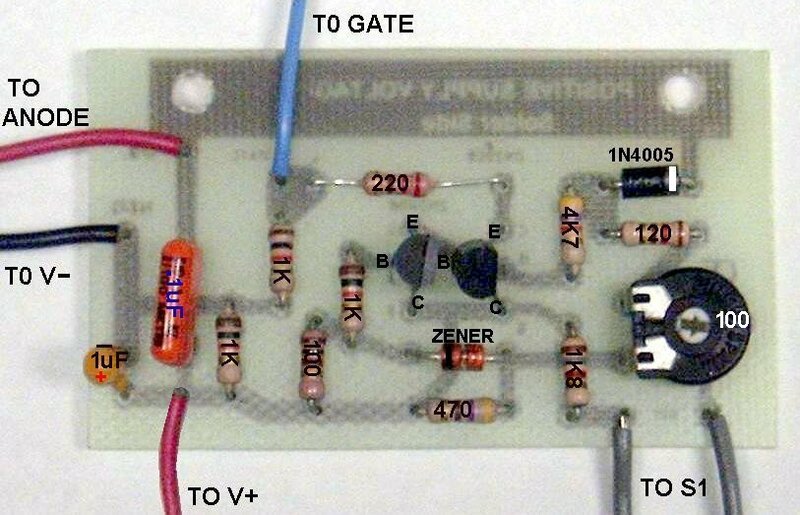 The 100 ohm trimpot on the PCB sets the Maximum Charge Voltage. To set this Correctly, attach a Fully charged battery to the output. output of 14.5 volts at Very Near ZERO CURRENT. 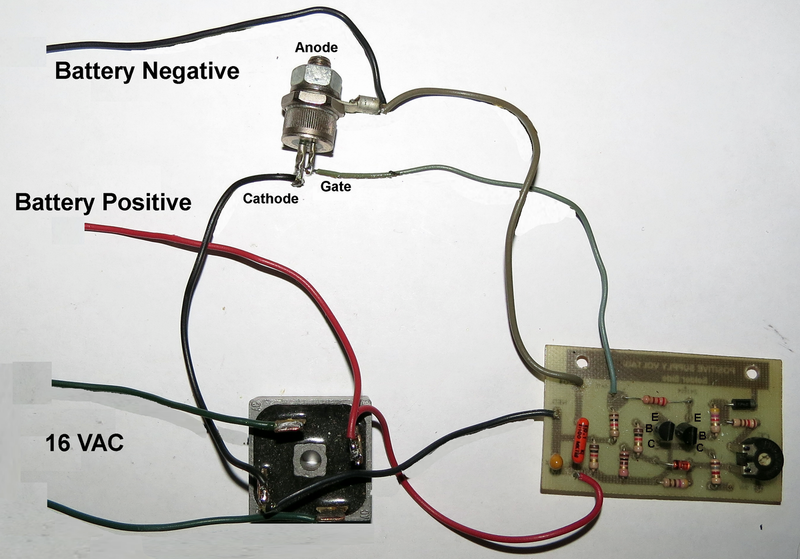 16 Volt transformer could be use with a full wave bridge rectifier. Some manufacturers recommend Charges with a Low Output, AC Ripple content. If this concerns you, You can add a large Filter Cap across the output. it is connect before the fuse in that line. "This PCB is Correct, Except the "C" & "E" on the Transistors are Revered." I can supply a PCB, if its needed by anyone. 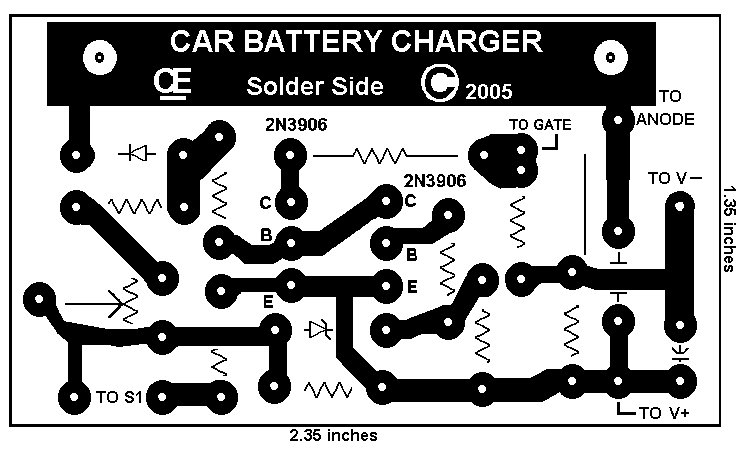 "Picture Overlay, Tested and Correct"
"Total CONNECTIONS Picture, I Believe I did this Correct,"
A Charging Guide from "Exide"
All Imformation in this Article is "Copyright protected" and "All Rights Reserved".